“We are not traitors or murderers or fanatics, but true Christians and good commonwealths men, fixed and constant in that noble principle of preferring the universality before particularity. John Cooke. Regicide. This is a very well written and soundly researched book. Jordan and Walsh’s book has been described as “ a work of popular history ” which it is and there is nothing wrong with that but that title does it a little injustice as the book go beyond that in that it is much more academically minded. The fact that both authors are not historians in the formal sense is all the more remarkable because this is a very serious attempt at a complex subject and should be looked at by any student, academic or member of the public interested in the story of the regicides. The book works on many levels. On a lower level, this is a personal story of a son’s revenge for the killing of his father. One minor criticism of the book is that the authors dwell a little too long on this. On a much higher level the vengeance expressed in the manhunt and ultimate murder of over twenty regicides was the product of a deep seated counter revolution against the very people who took part in the English revolution and especially against its most far sighted and courageous republican representatives. The first few chapters of the book give an adequate introduction to the events that led up to one of the greatest show trials in English and for that matter World history. The book could have done with a bit more research into the historiography of the events of the civil war and the trial itself. I share Geoffrey Robertson belief that “historians rarely have a good word to say about the trial: ‘Oh dear, oh dear – shocking, shocking’ was all that Richard Holmes, Cromwell’s advocate in the BBC’s 2002 Great Britons series, could manage (so it was little wonder that Oliver came last in the voting). J.G. Muddiman, the editor of the notoriously slanted version of the trial published in 1928 in the influential Famous British Trials series was a ranting royalist”. This downplaying of the importance of the trial of Charles l is also expressed by numerous revisionist historians. Perhaps the most eloquent of these is Blair Worden who in his book The English Civil Wars, believes that the war achieved nothing and that the parliamentarians "whose exploits were ... emphatically reversed" with the restoration of Charles II in 1660, would have supported John Dryden, view in 1700: that "Thy wars brought nothing about." Also in the 1640s nobody really wanted a revolution, no one wanted to kill the king and that the king died was a result of what he calls "the law of unintended consequences". The most open hostility towards the trial is expressed by Blair Worden in his book The English Civil Wars, believes that the war achieved nothing and that the parliamentarians "whose exploits were ... emphatically reversed" with the restoration of Charles II in 1660, would have supported John Dryden, view in 1700: that "Thy wars brought nothing about." Also in the 1640s nobody really wanted a revolution, no one wanted to kill the king and that the king died was a result of what he calls "the law of unintended consequences". Hopefully in their next book Walsh and Jordan will pay more attention to this historiography and less to drama. To their credit the authors have consulted Geoffrey Robertson book The Tyrannicide Brief. Robertson dubbed the regicides trial as the “the first war crimes trial in history” he also made a valid point in comparing it to Stalin’s show trial of old Bolsheviks. While not on the same scale both were counter revolutions against previous revolutions and both carried out a series of judicial state murders. This book is not a radical history of the English revolution. The authors are if anything sympathetic to the Whig interpretation of history and seem to be republicans. They believed that the civil war was a progressive development and support Robertson contention that “ The proceeding against Charles I in 1649 secured the constitutional gains of the Civil War – the supremacy of Parliament, the independence of judges, individual freedom guaranteed by Magna Carta and the common law”. Having said this it is true that large numbers of these regicides have been woefully under researched and their ideas and motivation have been largely left to small footnotes in old history books. One such figure is the leading regicide and republican lawyer John Cooke who has been finally recognised in a recent biography by Geoffrey Robertson. Cooke it seems is more known for his refusal to pick up the Kings silver top than for providing the theoretical, constitutional and practical justification for killing the King. As Cooke said "We fought for the public good and would have enfranchised the people and secured the welfare of the whole groaning creation, if the nation had not delighted more in servitude than freedom. "One thing is clear that many who took part including Cooke did not believe that the trial and execution of the king was a foregone conclusion. The majority of the leading figures of the revolution “did not at first want to kill the King”. John Cooke at the beginning thought that “the proceedings would end with some form of reconciliation”. It was only the threat of an intervention from the New Model Army that moved most of the leading regicides to kill the king. It was after all the army that wanted "to call Charles Stuart, that man of blood, to an account for that blood he had shed, and mischief he had done". Virtually to a man the regicides were leading intellectual figures of the English revolution. The majority were republicans and were “men of principle”. John Cooke was extremely concerned with the plight of the poor. He wrote in a number of publications calling for action to be taken to secure a better standard of living for the poor. In the book The Poor Man’s Case. He called for social equality and even called for a national health service, In another far sighted way he believed that poverty was a significant cause of crime, he would later call for limits to the death sentence and abolition of imprisonment for debt. He even urged fellow barristers to give away small parts of their salary in order to carry out legal work for the poor. Cooke for his trouble was hunted down like a common criminal and was a given the traitor’s death: hanged, drawn and quartered. Agents and spies were sent all over the world to hunt down and murder if necessary every regicide. In 1664 Sir John Lisle, a barrister who helped organise the trial but did not sign the warrant, was shot on his way to church in Lausanne, Switzerland, shortly after Edmund Ludlow and five others fled there from nearby Vevey. It is clear that the writers Don Jordan and Michael Walsh at times turn their book into a spy novel. They show how Charles spymaster Sir George Downing of Downing Street fame, and described by Samuel Pepys as “that perfidious rogue”, plotted and planned to go himself to the Continent, kidnap and if necessary murder then and there his former friends or bundle them back to England to stand trial and certain execution. It would appear from the book that the reign of Charles was dominated by this manhunt. While sanctioning what amounted to judicial murder the regime was hardly a picture of stability. The longer the show trial went on the more nervous Charles and his ministers became and recognised the growing danger of a rebellion. As Jordan and Walsh point out when the mistake was made to give a public funeral to one of the regicides over twenty thousand people attended testifying the still considerable support held for republican ideas. Another striking aspect of the book is the manner in which people who were once leading members in the Cromwellian era shifted their allegiances like some people change a shirt. Charles Monck, who has always struck me as a person of extreme opportunism was as one writer said “a turncoat of heroic proportions”. He had been commander in chief of the English army in Scotland and an ardent follower of Cromwell. But after being promised the unheard of sum of £100,000 a year for the rest of his life changed sides and decided to do the kings dirty work. One severe weakness of the book is that it fails to convey how the regicides lost power and a monarchy established albeit with the help of substantial sections of the bourgeoisie. There is an absence from the book as to the political and economic makeup of the Charles ll regime. The trial far from just being about revenge was a counter revolution by sections of the bourgeoisie who were still closely connected to the Monarchy. Given the skill of the two writers the failure to explain the demise of the republicans of the Cromwellian era is a major weakness. Even if the authors of the book are not sympathetic to Marxist historiography the least they could have done examined for instance James Holstun’s assertion that “ What turned the tide was the failure of bourgeois republican revolutionaries to unify themselves militarily, and create an interest and stake in the republic among the copyholders, soldiers, sailors and apprentices; and the superior power of General Monck and the forces of Restoration in shaping and controlling the army”. 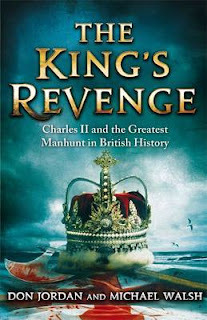 Despite the books many weaknesses I would still recommend this serious attempt at explaining the “Kings Revenge”. It is a cracking read and deserves wide readership and should be put on university reading lists on the subject.